It was a difficult and frenzy moment. I was waiting for a biopsy result. Is he suffering from cancer? It is my close friend’s husband, who is responsible for their multiple kids and his wife. He ended up in the hospital having several bumps on his neck and swollen feet which he thought was due to cold. He had excessive sweating too which he thought was due to bad summer. It turned out he is at phase 3 of Chronic Lymphocytic Leukemia (CLL cancer). Over a matter of few days, a normal assumed to be a healthy person ended up in a cancer ward taking radiation, getting blood and platelet infusion, suffering from liver cirrhosis, diabetes and living on pills and what not. It is scary to think further. All these diseases above (and many more) might very well be the effects of Vitamin-D deficiency. Vitamin-D is associated with 200 diseases as the current research reveal. 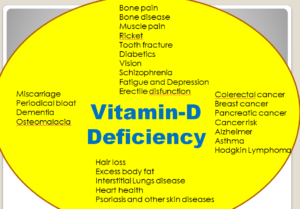 The family mentioned above, were not aware of Vitamin-D deficiency although, without conclusive evidence, it is hard to say D-deficiency is the cause of these symptoms. Is n’t it an alarming situation looking at the connection of Vit-D with so many of the life-threatening diseases? But the good news is, it is easy to have your Vitamin-D level upped to the medically desired level compared to being in the hospital and suffer at the end, if truly that D-nutrient is the cause. Are you eager now to know what effects did I see and feel? I will describe what my skin revealed and body felt as much as possible. Hope it will help you to identify or correlating your symptoms with mine. In the end, I got out of this and hope you will. I was Vitamin-D deficient with a dismal level of 4ng/ mL (the official optimal level was 30 ng/ mL). It was the first time I ever tested for Vitamin-D in my life. The effects I describe here is what I experienced at that level. I do not know when they started because I was not vigilant or have ignored them like many of us. Here are my personal experiences, that my skin revealed and body felt. I wish I could tell you when they started. I was so busy with my work and I was functioning well and never thought Vitamin-D deficiency is showing its color on my skin. I am not a spa person by any chance or passionate about uplifting my skin beauty. I am lucky if I see my face in a mirror before I office. I had that kind of time constraint with my work along with I really am a tomboy. The great news they were tested benign. 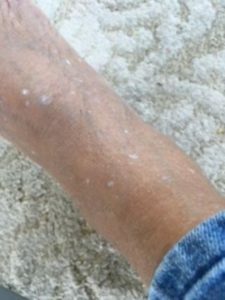 These disgusting spots disappeared with Vitamin-D supplements along with directly exposing my bare foot to UVB producing solar radiation between 11:30 AM to 3:30 pm for 25-30 minutes (I have a brown skin) and upgrading my food and life habits. The supplements I use was prescribed 50,000IU Vitamin D2 once a week after a meal (I shallow it after lunch) for 6 months followed by 2000IU Vitamin-D3 from OTC (shallow it after breakfast). It is a daily dose and I am using now for over three years. I am still on and will use it until I am alive. Per my observation, exposure of the barefoot directly to sunlight worked really well while I can’t ignore the contribution of supplements, either Vitamin-D2 and D3 and other lifestyle uplifting habits I adopted. In the right-hand side of the picture, the feet were massaged with sesame oil and the picture was taken after the shower. Let me tell you the feeling of exposing my bare back skin for the first time in my life. I felt something is happening like a little worm is swiftly walking on my skin the very first few days. It felt like a small insect is moving around. I was not feeling hot at 80- 85 oC on my well-lit deck. I get inside When I felt the heat on my skin. There were many sunny days in the summer months and I was on 2000IU Vitamin-D3 supplements/ day eating right after my breakfast swallowing it. The big message is Vitamin-D deficiency can be treated. What I could say is sun is the cause and cure of the white benign spots. This is reflected quite well from the above picture. Now, are you interested in what was my Vitamin-D nutrient status when these spots disappear? More than a >5X lift from 4ng/ mL to 25.7ng/ mL. I did see these spots at 18 ng/ mL (interim measurement). I owe you the treatment condition that I adopted in another blog to help you in your low D problem. Have you ever gone through this? How embarrassing can this be in a work environment? Here is my experience and check if you can relate to yours. I can’t remember how many times my pants were wet before sitting on the toilet cover and how had I have tried this not to happen. At times, I carry an extra pair of pants to restroom and change. To alleviate this embarrassment, I got into timing mode to set up an alarm every few hours. It did work to some extent. Are you thinking about a bladder problem or something else as the cause? No, my bladder was not the problem. Neither, it was due to sneezing, coughing, holding on to urinate because I was completing a task before visiting the bathroom or extreme anxiety that you feel before a difficult life making-breaking test. In fact, this happened in the period of my extreme Vitamin-D deficiency. I failed to control this supposed to be a natural process every time. The biggest news: I upped my Vitamin-D level from 4 ng/mL to 25.7 ng/ mL ( 30 ng/ mL was normal) and got relieved from this sweaty situation. I love food as many of you are. But I never wanted to be almost always feeling hungry after the meal , even after the meal. This was the situation when I was suffering from low level of Vitamin-D. I was also craving for sweets after the meal. A company I worked for, offers free healthy snacks including fresh fruits and varieties of drink possibly because they do not house an in-house cafeteria. I quench my thirst and hunger visiting the kitchen and still feel I should eat more. After I upped my Vitamin-D level, it all stopped and I was satisfied with my regular meals. Scientific research supports this as well. Can you imagine correction of -1.25 to normal 20/20 after upping my Vitamin-D level? It is unbelievable to me and maybe for you as well. I am driving without glasses! I never expected and checked out literature to find how general it is and has anyone reported it. With my extensive search, I found Vitamin-D receptors are pleiotropic in nature and they morph with retinoid receptors. I am not sure of the exact reason here for vision correction. The world is in a rat race of losing physical weight, of course for an important reason-to had a better health. I am one of them but like natural processes though like many of you. I was wearing 178- 181 lb with a height of 5’ 6”. I was not dieting or taking in any extreme measures to knock off the extras. My ideal weight should stay between 108 and 148 lbs per my primary care physician. Great news: I am around 148 lb in the high end with diet, exercise and upping my Vitamin-D and took about 2 yrs. I find it hard to get it down to the lower end. The weight kind of plateaued for several months. Your heavyweight might be connected to the low level of Vitamin-D. Several studies point low vitamin-D connection to abdominal obesity and visceral fat Vitamin-D reduces physical weight. Looking at my dental cleaning record and cavities filled during the time of my Vitamin-D deficiency period, it was at the highest level and might have been occurring before. I had occasional bleeding while brushing. Those are now taken care of. My overall dental health has improved with respect to cavities and gum bleeding. 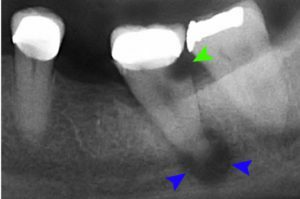 The tooth foundation was compromised during the process. Calcium which is stored in bones and teeth is always in a state of motion. In case of a need, the body hauls out calcium from this storage to replenish the deficiency in the body. When Vitamin-D is low, calcium is not restored back in bone and teeth. That makes bones weak, prone to fracture. It results in tooth-decay and cavity formation. Vitamin-D regulates calcium absorption, the deficiency can result in deformed bone. Vitamin-D and Calcium together strengthen the tooth. D-deficient children experience late teething and deformed teeth. I was sweating like crazy from my forehead during this low-D-nutrient period but never felt a fever. My doctor was asking about this before she ordered a Vitamin-D testing on my blood. I was not sure how many years of D-deficiency I was suffering from. Professor Michael Holick, M.D., the pioneer of Vitamin-D research says that this can be one of the first signs of Vitamin-D deficiency. Sweat can come from multiple sources. It can come from cancer symptoms, high-stress (may lose your job, that feeds your family), thyroid problems, diabetics, and infection etc. Sweating is a good indicator of the heart attack. How do you pinpoint this symptom to low Vitamin-D? Look at your composite symptoms. Can you say you are at a dismal D? Make a visit to your doctor for a diagnosis to confirm. I was not suffering from any other major illness. I used to wear reasonably think hair. The area I live in has good water I shower with. During my low D level time, while combing my hair, my comb gets jammed with hair. I used to get scared can I will lose it all! My parents and the rest of my family, all have decent hair and none of them were bald. That was giving me little assurance. I never had comprehended it can be due to a shortage of Vitamin-D. I got them back after I recovered myself. I am not losing hair like crazy I used to be. Scientific literature supports this. But research and expert opinion suspect Vitamin-D help regulate the expression of genes that foster normal hair follicle growth (Rania Mount Abdel, MD, and dermatologist). This is not my direct experience but because it happened in front of my eyes in my house. One of my family members was suffering from Eczema. Using a doctor prescribed Vitamin-D ointment on the eczema patch cured him. If you see this kind of patches, you seem to have D-deficiency. Eczema is a skin condition which is seen as red, itchy, dry skin patches on the skin. Eczema can be contagious if it is infected. People with low Vitamin-D are known to suffer from skin ailment like a bacterial colony and skin infection. There is solid scientific evidence supporting the fact that Vitamin-D cures eczema. If the patch is not cured by Vitamin-D, it might not be eczema per Vitamin-D council. It is that strong an evidence Vitamin-D cures Eczema. Eczema could arise from several conditions. Children of eczema suffered patients may get infected with eczema easily. Topical application of doctor prescribed Vitamin-D ointment has cured eczema in one of my family members. So It was clearly for D-deficiency and not due to other reasons. This person is on 2000 IU 1 tablet/day and has not had a flare up after the cure. Skin and mind are well intertwined. A stressed and depressed mind acts shortening the telomere and can place the root for skin aging. Based on current research, the D-nutrient level is modified. The following chart is from the Institute of Medicine. Vitamin-D council has a similar but little different label. Ignoring confusing symptoms of early Vitamin-D deficiency? Vitamin-D deficiency test involves money (~$53 dollars one time). Should I spend this money when I don’t have clear symptoms? Conflicting messages in the web to misguide people Vitamin-D deficiency is overrated and a hype. Who do you trust? My current doctor did not know about Vit-D deficiency. Forget general people. The world population does not have awareness specifically in underdeveloped countries. Hey, we have bright sun in our country. We can’t be deficient with Sun Vitamin. I have got responses of this kind from educated people while discussing D-deficiency. You know just having the sun is not enough. I have given a synopsis of what my skin revealed and body felt during the dismal Vitamin-D period. Vitamin-D works in its hormone form. Every cell of the human body has a Vitamin-D receptor. Known as sunshine and bone Vitamin, the effects of a Vitamin-D deficiency can lead to detrimental health and wellness consequences if not treated. New symptoms are added on regular basis to the repertoire from ongoing research and clinical trials. The good news is Vitamin-D deficiency could easily be treated. My originally measured level at 4ng/ mL was elevated 25. 7 ng/ mL after 2 years. I am still on using 2000IU of Vitamin-D3 every day after my breakfast. From my personal experience, I would recommend doing the following. 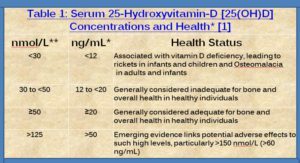 Check your Vitamin-D level (25-hydroxy-Vitamin-D) per the advice of your physician. The cost of this could be as high as $53.00/ one time but it will outweigh all your odds. Expose to sensible sunlight for 10-15 minutes at solar noon time 3 times a week. Enrich your meals and snacks with Vitamin-D and fortified food. Use supplements if recommended by your doctor. Don’t mortgage your 7-8 hours of sleep for anything. It’s great to bring awareness to a situation that can easily be avoided with the correct nutrition intake, I work night shifts and there was a period where i hadn’t seen sunlight for months, and to be completely honest i did not feel that great at the time. Small changes like going out for 15-20 minutes a day to be exposed to sunlight has proven to be beneficial in my case. I also think that paying for a vitamin D deficiency test is well worth its price because after all whats more important than your health? I worked years at night shifts and also during the day inside. That for sure, made me Vitamin-D deficient. If there is sun you can expose yourself everyday, I believe you should be good. They are changing the Vitamin-D status of every couple of years based on research finding. I aspire this article will create awareness. It is better be safe than sorry. Hello and than you for this informative article Ansuya. I had a really nice time reading it. Some useful information you got there. I never knew that Vitamin D deficiency can cause that much health issues. I taught Vitamin D was not that imporant for us. Oh boy I was wrong. I definitely have a few symptoms. I have dental cavity and i also feel hungry after a meal. These are the two main things I noticed about myself. I will search for good supplements. What supplements do you use and are there doing the job for you? I am happy you found the article informative. We never know enough, that’s the way I feel now. I never thought, coming from India, I will test D-deficient. 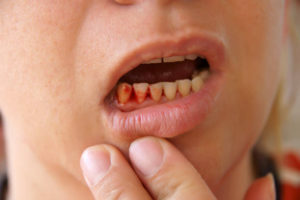 If you have cavities, it might be an early stage of the D-deficiency. I was prescribed by my doctor for Vitamin-D2 50000 IU (once a week) and 2000 IU over the counter medication (1 tablet daily). How about, you ask your doctor during your regular check up or may be just call and find out. My son’s doctor has recommended taking a Vitamin-D supplement since the moment he came home from the hospital, and all he ever really said about it was that people just don’t have of it. I never knew any of the symptoms of deficiency. I’m curious now as to what my levels are, as a few of the symptoms make a lot of sense to me. Things that you think are normal because you’ve had them for years, but are probably a sign of something else! This was a really great read, thanks! My daughter was treated for Vitamin-D deficiency but she upped it up after few months. Some of the symptoms are so easy to ignore or forget. I think it is better to a test done to know where we are at. Thank you, you liked the article. Nothing can be taken taken for granted in life. Good that you are taking vitamins and supplements. You are right, take the sun bath. They recommend to take it during the mid-day (solar noon) to get the maximum effect. How about asking your doctor, next time you visit? Hello good and informative post. Waoo it is really an event opener. I think i have seen some of these symptoms and I never took it as serious. Imagine that you get Hungary after meal, oops. Thank you for taking time to read the article and you found it informative. Exposing your bare body to sunlight is a major source of obtaining Vitamin-D. But as we know it is not always available. Summer months are better than winter and it depends where you live etc. Because it is such an important vitamin-D, it is better to visit a doctor. wow I knew that vitamin d was good for your bones and teeth, but I had no idea it could cause all these other serious symptoms. I’m glad to hear though that after upping your vitamin d intake, that you started getting better. I’m not sure if I skipped over this in your post, but what would you say is the best way to get vitamin d? Milk or maybe a capsule? Also how long does it usually take to see good side effects after increasing your dosage? Thank you for your time reading the article. Vitamin-D known as bone Vitamin-D is now found to be connected to 200 diseases. We need it everyday for different activities. I also had very little awareness before I started writing. How I cured the D-deficiency will be my next blog. Diet like fatty fish such salmon, sardines etc, some mushrooms , fortified vitamin-D milk, yogurt, cereals have Vitamin-D. But if you can, ask your doctor to do a check-up to know your status. He or She can advise you for capsules if at all. For me it took ~6 months to see the effect of improvements using 50000 IU of Vitamin-D2, once per week (Prescription medication). I was also having one capsule 2000 IU Vitamin-D3 everyday. To see my spots disappear (I think, it is sunlight exposure), it took about 2 years.